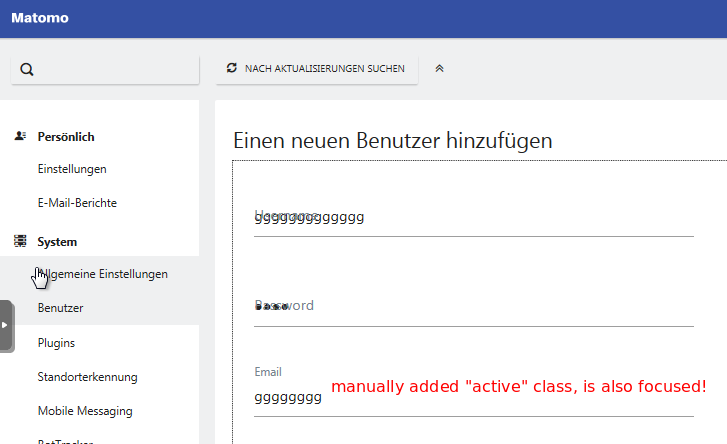 The onfocus and onblur events are missing or not working, they should add/remove the active class from the label. The :focus pseudo-selector does not work, nothing is turned green. We'll need to see if that's an easy fix or not. Do all other forms work well? Wondering if it is a materialize.css issue or an issue with our code. I did not check other forms, just confirmed the message in forum on our test VM. I've debugged for quite a while and found out that the disabled attribute is causing it. Was at first thinking that it accidentally sets a disabled attribute on the input form, but the problem is actually the disabled attribute on the DIV element that defines the form component. When removing this attribute, everything works as expected. Calling Materialize.updateTextFields() fixes the issue, but would need to be called after every field change/keystroke/... so this is not a solution. Haven't debugged this further, couldn't really find a fix so far. Wonder if it is some IE or jquery bug. the only solution I can think of so far is to provide an alternative attribute and deprecate disabled in field-directive.js. Could use matomo-disabled=... or disable=. This worked for me as a workaround. @fdellwing @diosmosis any thoughts maybe? I can confirm, that the disabled is causing the issue. If it is not a big deal, the easiest solution would be to refactor it to something different. To not break with HTML specs I would propose data-disabled.